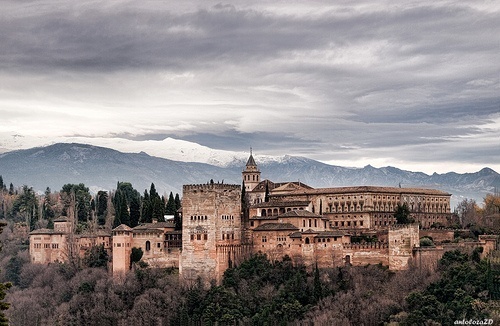 While you may have heard tales of the Moorish incursions into Spain, and their resulting impact upon the history of Spain, you may not have heard of The Alhambra Palace. 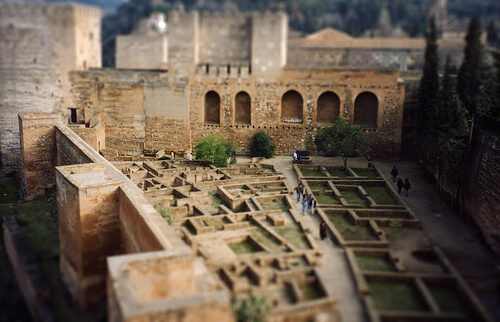 Known as Qalat Alhambra, which literally means 'Red Fortress', to its original builders this impressive historic fortress located in Granada saw its beginnings as far back as the eleventh century. Moorish invaders into the southern reaches of Spain were the first builders of this very impressive structure. It was originally completed during the latter half of the 14th century, during the waning days of Muslim rule, by Yusuf I and Muhammad V who were the Sultans of Granada during that time. The fortress was built as a place of refuge for those seeking to escape the many Christian victories that were taking place in the area. Thus, many Moorish poets, artists and intellectuals spent time in the fortress in its early days. Following the Spanish reconquest of the area and take over of the palace, there then began to be Spanish influence over the continuing building of the structure. 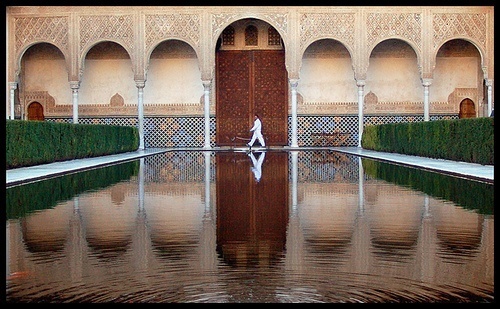 The Alhambra in its present day form continued to be added to by its original builders and the subsequent Spanish owners over the course of more than two centuries. The many and varied styles of art and architecture to be found in the Alhambra, along with its immense size, are a great deal of what has made this fortress one of such historical significance. Influences from the original Moorish owners can still be seen in many parts of the fortress, sometimes right alongside later Spanish influence. The fortress now stands almost as a testament to the power of culture, both waxing and waning. The Court of the Lions: An internal courtyard dominated by a fountain containing Muslim lion sculptures at its base, restoration work has recently begun on the stone lions. The Tower of Justice: The original entrance to the complex, constructed in 1348 by Yusuf I. The Hall of the Abencerrajes: Contains a beautiful architectural dome of honeycomb-like intricacy. The Hall of the Ambassadors: The grand reception room, wherein was placed the throne of the Sultans, in just such a location Christopher Columbus was likely to have been received by Ferdinand and Isabella. These are just a few of the impressive features of this immense structure. The true significance of the Alhambra lies in the fact that it still stands, containing a vast array of historical and cultural influences throughout centuries of use. Anyone with interest in the history of Europe, and especially that of the Moorish influence on Spain, will not want to miss The Alhambra. Taxi or City Microbus: There is a rank and a bus stop in Plaza Nueva. The 30 and 32 Lines of the city bus have the following stops in the Alhambra complex: 1 The Ticket Offices (Entrance Pavilion), 2 Torre de las Cabezas [Tower of the Heads], near the Charles V Palace and the Nasrid Palaces, and 3, the Puerta de la Justicia [Gate of Justice], the nearest to the Alcazaba. If you like walking, the best option is to go up on foot from Plaza Nueva, through the woods, along the street Cuesta de Gomérez, or to go up the street Cuesta de los Chinos, from the Paseo de los Tristes or through the Realejo quarter, to the Hotel Alhambra Palace from the square Campo del Principe. All the options on foot involve a quite steep climb of approximately 1 km. If you’d like to get the full guided tour, there are a number of providers who can help you book one before you get to Spain. - Daytime: Monday to Sunday: 8.30 a.m. to 8 p.m. The ticket office: 8 a.m. to 7 p.m.
- Night-time: Every day from 10 p.m. to 11.30 p.m. except Sunday and Monday. The ticket office: 9.30 p.m. to 10.30 p.m.
- Daytime: Monday to Sunday: 8.30 a.m. to 6 p.m. The ticket office: 8 a.m. to 5 p.m.
- Night-time: Friday and Saturday: 8 p.m. to 9:30 p.m. The ticket office: 7.30 p.m. to 8.30 p.m.
Last updated by jack on 18 February, 2014 in Destinations.